St. Olav is credited with Christianizing Norway in the 11th century, often with the force of the battleaxe. This icon was inspired by the painted altar front in Nideros Cathedral in Trondheim, Norway. 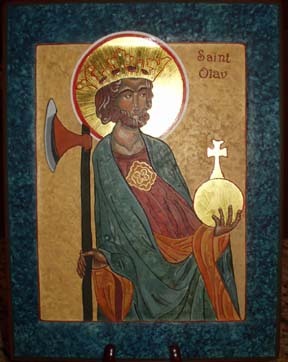 Olav is wearing his kingly robes, crown, and holding an orb topped with a cross. In his other hand he holds his battleaxe which was the instrument of his martyrdom. Click to link to the history of the 13th century altar frontal at Nideros Cathedral, Trondheim,Norway. Click to link to St. Olav biography.